Now here is my post! This was created by Kyla a few months back. The next one was created by Kyla last week. 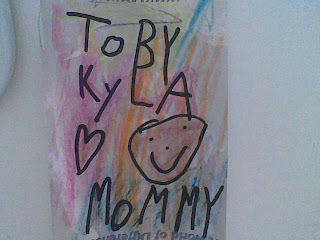 Kyla, I am so blessed to have a very bright and artistic little lady like you as my daughter. Thank you for all the thoughtfulness and love you have given me. Though you can be strong-willed at times, I know that you are wonderfully created by God and that He has His purpose for choosing me as your mom. I pray that I can be the mom you need me to be. I pray that may you grow up with the fear of the Lord in your heart. Forgive me for my shortcomings. I love you and will always be here for you. Toby, you are a blessing to me. Thank you for your sweetness, for your kisses, for your smiles, for always bringing a smile to my day. You always seem to know when to cheer me up. Thank you for teaching me so much about trust, love and total dependence on God. I have been learning a lot from you. I pray that may you grow up to be a man after God’s heart and may you seek Him first in your life. I also pray that I can be the mom you need me to be. I love you and you can count on me, anytime. Share your love letter from or to your kids, join us at mommy moments! come to think of it, I haven’t made one for them! hmmm…got to write a letter for them so they can read it and I show it to them someday!!! it always warms my heart when my kids give me cards. I posted my collection of VDay cards I received from my kids. What sweet pictures to receive! And what darling letters written to them. I have taken to writing my son a letter every so often, and then sealing it and storing it away to give him when he’s older. Thanks for your comment on my blog! I hope you get the chance to create your will, as I did! wow chris that is so sweet!!! 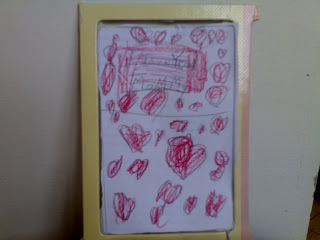 ganda nmn ng drawing ni kyla…canlt wait to see my kids making love letter for me dn hehehe =) here’s mine! Chris! Inggit ako sa love letters mo. I really hope to get some soon from Mia. And the love letters for your kids are so sweet! I’ll take that idea on board for next year! Great love letters for your kids. Actually, I got this meme all wrong. I thought “love letter” refers to all kinds of love letters, including those made by hubby for me or me for hubby kasi it’s Valentine’s day. I actually woke up early to post my entry, but when I saw your post, I quickly deleted mine. I’ll be composing my love letter to my kid right one. I’ll have a late post. im joining! tnx chris for this sweet opportunity. God bless you! sweet ng kids mo Chris just like mine. wow from the heart talaga…. Galing naman ng mga babies mo! 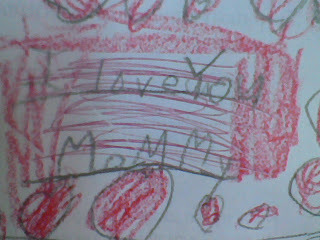 Ako din wala pa akong love letters from my son.. pero I do have many love moments to share..
Love the love letter theme! So so sweet! In time for the valentines too. oh thats so nice and sweet of your kid.. I hope I could receive mine from my dollie princess someday =) Yor letter is touching also.